Earlier this year, MS announced a new program for indie developers to directly publish their games on Xbox One and Windows 10. In July, the Creators Program was launched with a bunch of games of very different styles. 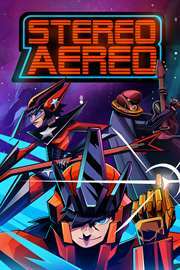 Stereo Aereo, a rhythm arcade shooter from Salvadoran studio Stone Bot is one of these games. And the first game of the program reviewed by LifeisXbox. To know more about this game, follow us into this intergalactic musical adventure. The gameplay is very simple: you control a ship in a track made of 5 segments where you must avoid obstacles and destroy enemies using the laser of your spaceship in the rhythm of the music. A spot-on shot grants you a perfect score. Taking a hit destroys your sequence, resetting your combo counter to zero. Consecutive hits (the amount depending of your difficult level) destroy your ship, making you restart the stage. Building long combos and stacking ‘perfects’ is the only way to make your score reach the high stars! Rhythm games usually don’t have a story behind the gameplay. Stereo Aereo, to my surprise, has a simple but interesting one. During the game, you guide Rock Rocket, Harmony Reef and Soul Old Orleands in a race against time in which they’ll face police, deadly robots, asteroids, desert marauders and many other enemies trying to stop you. Quite an unexpected adventure for a musical game. Not only does the game have an interesting story, but it also has bosses. Challenging bosses. Just remember to do things, be it to maneuver your ship or to destroy obstacles with your laser, following the rhythm of the music and you’ll be fine. The game has good visuals. They’re simple, colorful and well designed. A clear homage to the 80’s sci-fi, with all those neon in the screen. It also has simple cut scenes with cartoon graphics to tell the story. The songs of the game are great! Maybe not all the tracks will pleasure you but I bet some of them really will do. You have tracks that goes from progressive to folk, from glam to heavy. A truly diverse rock and roll playlist. Some tracks are really long. Not a true problem for those who played Free Bird or Through the Fire and Flames in old Guitar Hero games but it turns out to be really annoying when you’re playing in the harder difficult levels, lose the battle against the boss and needs to restart the level all over. Voice acting is good. The voices really match the characters. Just wished they didn’t complain that much whenever I’m hit by an obstacle. I don’t know if it only happened to me, but sometimes I felt like the music wasn’t really aligned with the animations, like there’s a split second between the beats and the right moment to press the shot button. Again, maybe it’s only with my TV and audio system. If not, it’d be something very harmful to the gameplay. I had some trouble to follow the conversation between the three characters during the gameplay: I always had to choose between paying attention to the music or the story. It’d be better if during conversations, the action gave us some time. I often missed long combos trying to follow what they were talking about. There’s little to none replay value. After you beat the story mode, you can revisit the stages in the arcade mode or try it again in a harder difficult level. But I doubt you’ll do that, because the game becomes repetitive and uninteresting after some time. Stereo Aereo is a good mix between musical and arcade shooter. A beautiful 80’s sci-fi and rock and roll universe with simple gameplay and a simple but interesting story. It has some issues that harm your gameplay. If you can get past them, you’ll have a good experience with a great soundtrack to enjoy. Previous Article Ready to play with Chloe Price?